While most British cycling fans will be able to identify Dave Brailsford and Rod Ellingworth with ease, the names of Gareth Sheppard and Chris Furber may not roll off people’s tongues as easily. However, they are to Britain’s paracyclists what Brailsford and Ellingworth are to Team Sky and the able-bodied British team. 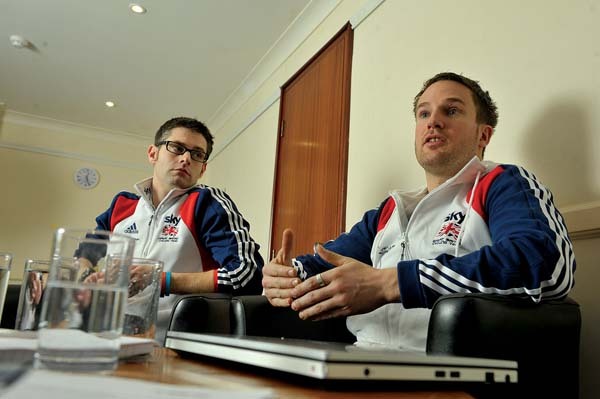 Performance manager Sheppard and lead coach Furber have been in their current roles since 2009 and 2006 respectively, and the young duo have masterminded over 60 paracycling world titles during that time. They tell Cycling Weekly about their hopes and preparations ahead of the Paracycling Track World Championships, which took place in Los Angeles in early February, and look ahead to the London Paralympics. 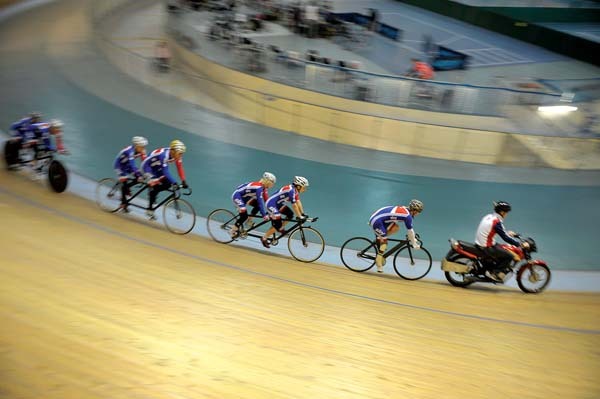 CW: Going into the Paracycling Track World Championships, how would you assess where the team are right now? Chris Furber: Things are looking good for us. The Track Worlds are an event in which we’ve done well in the past; we won nine medals in Italy last year and I think we’re looking to be very close to that mark again this year. Preparations have been excellent going into it; we’ve been able to come to Newport and really focus on our training and we’ve seen some really fast times as a result. The squad as a whole are stepping up now. On that note, how much have the riders’ attitudes changed since 2012 – the Paralympic year – began? CF: I think there has been an element of that in everyone’s mindset. It would have been easy to lose momentum coming off the Beijing Paralympics. We performed so well there [GB won 17 golds and three silver medals in the cycling events] and the squad was so talented. However, it feels like everyone is fully focused on London and that we’re taking this opportunity to use LA as a build-up towards the Paralympics. I think a big turning point came when we sat the riders down in November. They realised by the time they got to the Track Worlds, London wasn’t far away at all. Whereas 2011 for us was about travelling the world and getting as many qualification points as possible so we can have as many riders for London, this year is all about performance, and we’re cautiously optimistic. Gareth Sheppard: I think the major difference between this year and last year is in the approach we take before the championships. Last year, with them being in Europe, we were able to take a large squad and that meant we had athletes picking up silver and bronze medals. LA is only about two things: picking up as many qualification points for London, and returning with rainbow jerseys. The squad has been selected to achieve that, although we know that will have an impact on the number of medals we win. The qualification system for the Paralympics seems even more complex than that for the Olympics. Would you agree? GS: Our strategy has been centred around keeping track of how many qualification points we had and still needed. We wouldn’t have done as much travelling over the last 12 months if it hadn’t been for the points on offer. In order to qualify as many athletes as possible, riders have to do road and track events to pick up the maximum points. You wouldn’t see that with the Olympics. Unfortunately, the UCI structure means we have had to take a far different approach to what we would have preferred. Did you have to change the preparations for the Track World Championships because they’re a month earlier than they were last year? CF: No, not really. Because Montichiari last year was so successful for us we’ve tried to have a similar build-up this time around. All we’ve had to do to accommodate for them being slightly earlier is to move everything forward a little. If the preparation for the Worlds works we can just tweak it slightly or replicate it for the Paralympics. Will it be difficult for the riders to peak twice in major competition this year? CW: No, I don’t think it will. Looking at the calendar, we can see that we should be able to peak at the Worlds and produce the best performance we can. Then we’ll have a period of 14 days in which the riders will be almost off their bikes entirely. We’ll then go to Majorca at the end of March and start building up to London from there. So we do have a break which I think the athletes, and the coaches, will need. It will give us the chance to review what happened in LA, and we will need to look at the results with a clear head and work out what we need to tweak. How useful have you found basing yourself in Newport over the winter considering that the team’s holding camp before the Paralympics will be there? CF: While we’re integrated with the able-bodied programme, we need to have a distinction between the two. They’ve got a massive period going into their Worlds right now and we have the same. If we were all in Manchester we wouldn’t get the best out of everyone. It makes sense for us to move out of that environment. The integration works well during times of standard training, but when events get nearer we need that distance to ensure we’re focused. GS: The Newport Velodrome is similar to the London track in the way that it’s built. That makes it an ideal venue for the athletes to train on without having to spend large amounts of time in London. We will spend some time there eventually, but it has a unique challenge in terms of riding on the road. Because of its location you don’t really have that option of going out for a quick spin. Newport gives us that nice balance, and it’s a change of scenery for us compared to Manchester. We spend nine months each year there and that can get stale. The fact that we follow the same process every time by coming to Wales, it provides a nice dry run for the riders and helps us to get the preparation exactly right.